About 2,000 eye injuries occur in the workplace each day. That results in more than 700,000 injured workers every year. Between 10 percent and 20 percent of these injuries result in temporary or permanent vision loss. It is estimated that $300 million are spent each year in loss of productivity, medical treatment and workers’ compensation due to eye injuries. 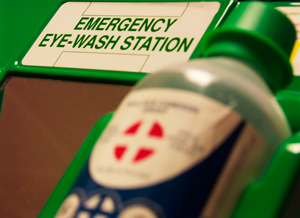 Protect yourself and your co-workers by implementing these simple eye safety tips. Visit an ophthalmologist or optometrist and have your vision assessed regularly. Not only do you reduce the risk of injury in the workplace, but you can also improve your overall well-being. Regular assessments can also detect gradually occurring vision problems and allows you the opportunity to discuss with your doctor the unique risks and hazards your eyes face in the workplace. Based on the work involved and the risks, different levels of protection are required to reduce eye injuries. Be sure your safety eyewear has been fitted by an eye care professional to eliminate the risk of falling off or other fit issues. Your eyewear should be comfortable to wear and allow you to maintain your peripheral vision. All occupational safety eyewear should meet standards set by Occupational Safety and Health Administration. Safety goggles entirely enclose the eyes and surrounding area. Some workers who wear eyeglasses on a daily basis might prefer to wear goggles, rather than safety glasses, over their existing eyewear. All workers who interact with chemicals should wear safety goggles to prevent eye injuries. Certain work environments require safety eyewear designed specifically for that industry. For example, work that involves harmful radiation, such as X-rays, requires leaded glasses. Other jobs, like welding and fumigating, require face shields and full-face respirators. We understand accidents happen. If you have experienced an eye injury on the job, and adequate precautions were not made by your employer, you might be entitled to compensation. You need an experienced workers’ compensation lawyer to get you the Results You Deserve®. Call KBG today and ask for a free consultation.